Okay, I did something that made me feel just a little dated recently. Now I know I'm not old but I am really starting to see how quickly the years start to slip on by. Well, the other day I decided to talk to my son about how sometimes your best wins in life don't always result in a first place finish. He is approaching his seventh birthday and he is starting to take an interest in sports so I thought I should talk to him about the importance of putting forth your best effort. When I was in college I fenced on an amateur basis in a club at Binghamton University. I absolutely loved it. Let me tell you, if you want a sport that will get you in shape ultra fast while learning how to strategically beat your opponent, there's no better sport than it. 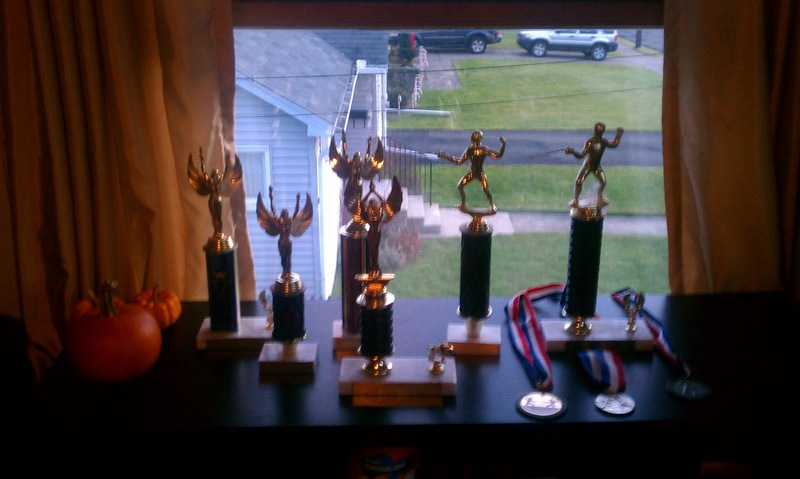 Now I would like to stress I was an amateur, but I did rack up a few medals and trophies in my day. 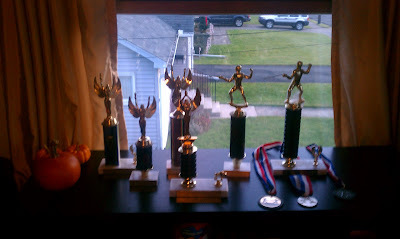 Anyway, my son was curious to see the trophies the other night so I took them out and reminisced about "the good old days." 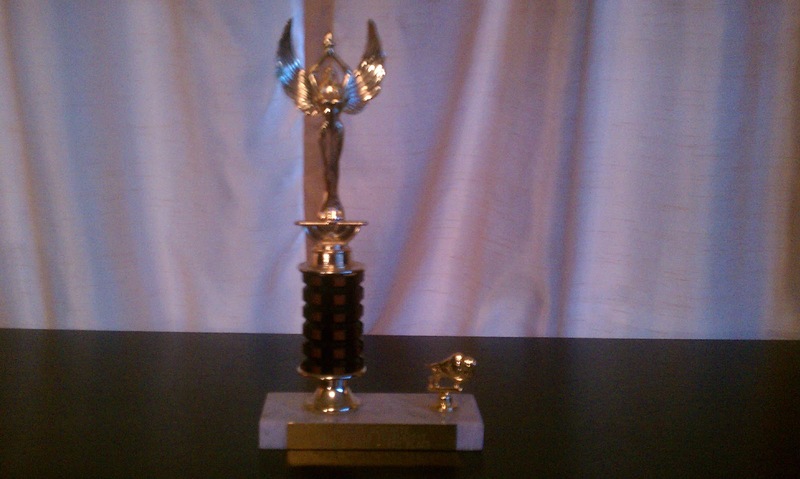 I asked my son which trophy he thought was my favorite. He automatically went to the tallest one out of the group which happened to be a first place finish in novice foil. Foil was the weapon I fenced with back in the day. I then went and told him that in fact, my favorite one was one that I had received for 4th place. Now at my son's age he is all about winning so he turned and looked at me rather strangely and asked why. The story goes that it was I believe Spring of 1991 and I was competing at a tournament at SUNY-Buffalo. When you entered the gymnasium they had laid out on tables the trophies. In my mind before entering the gym, I thought I was going to do my best but more than likely I would be going home with more tournament experience and a good workout and that was it. This was my first year fencing and there were a lot of serious fencers at this meet. I think one or two girls had gone to the nationals so seriously there was no way I thought to myself that I had a chance at winning anything. Well then I saw that they had trophies up to 4th place. Suddenly, I thought to myself --Maybe? However as soon as this thought crossed my mind I saw a girl from Syracuse who I had yet to beat at any competition. She was my nemesis. Sweet girl, don't get me wrong, but I just couldn't figure out how to beat her. Then I looked at that trophy for 4th place again and I told myself that that trophy was mine. Today was going to be the day I was going to figure this out. As I'm telling this story to my son, I am pleasantly surprised to see he was truly interested in his mother's tale from long ago. I thought for sure I was boring him but I continued on. In a nutshell, I worked my way through the first round and managed to work my way up to direct eliminations. I had to fight my nemesis, Leila, if I was going to get to 4th place. It wasn't pretty, but in that bout something happened that I have always carried with me ever since. Persistence pays off. It was not a pretty bout but I managed to figure out by the end how to beat this girl. What I had thought was impossible, became possible in a few short minutes. I had laid it all out and in the end I was able to beat this girl. With nothing left, I quickly lost my following bout, but in my head I was beaming with joy from what I had accomplished. My son then said, "I get it. You gave it your best shot and you didn't give up." I said "Yes! That's it." That's all I can hope for as I continue on this journey of motherhood. As I teach him about life lessons, I just hope I can continue communicating with him so I know that he continues to "get it." Every so often when the whim hits I feel like sharing my stories. Today was one of those days. Anyway, before I pack these babies up I thought I should share a couple of pictures.